Spring has finally begun to show up, and so has the new apparel from Patagonia! Shop our wide selection of men’s and women’s Patagonia apparel in store and online. Tons of new apparel and hardgoods! Tees, Longsleeves, Sweatshirts, Decks, Stickers, and more. Tons of New Stance Socks! We’ve got 20+ new styles of Stance Socks that are available in store. These include collabs such as Rick and Morty, The Grateful Dead, The Looney Tunes, and Shake Junt. Inspired by modern mid-century details and illustrations, the Vans x Yusuke Hanai collaboration showcases the Japanese artist’s aesthetic and style. 100% carded ringspun cotton and features a vintage overdye. The Sunset Wash Short Sleeve T-Shirt is a heavier weight 100% combed ringspun cotton t-shirt with an allover tie dye and left chest logo graphics. The Back Patio Boardshort 18’ is a 90% polyester, 10% elastane water-resistant boardshort featuring the Vans premium 4-way Sturdy Stretch fabrication that strikes a balance between in the water performance and on the beach wearability. This Spring, two of the world’s most iconic skate brands team up again for a unique collection of footwear and apparel that celebrates both brands’ storied histories. Shop the collection in store and online! 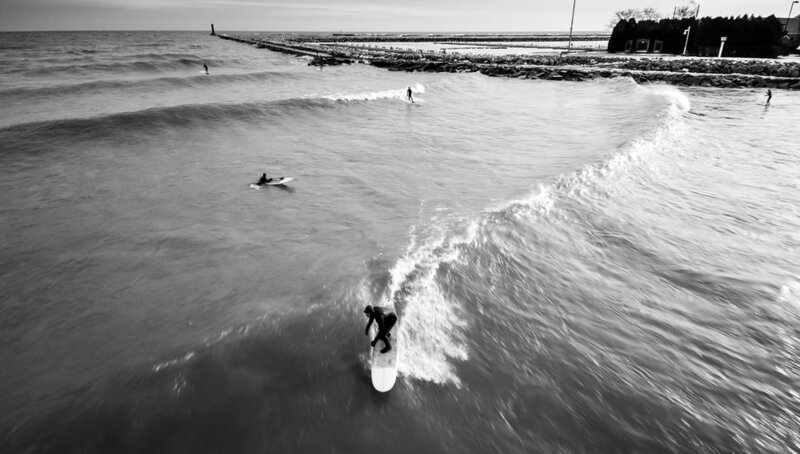 As Wisconsin's first dedicated surf shop, EOS is the destination for adventurers with the passion for surfing and paddling the Great Lakes and Midwest waterways. EOS combines appropriate gear and knowledgeable staff to get you going on your next adventure! EOS & Rev celebrate twenty years! 1st Annual Sheboygan River Riot! One of the best ways to get on the water is SUP or Stand Up Paddleboarding. Basically paddling big surfboard style boards while standing up. You can paddle any waterway with these in different conditions - inland flat water, rivers, surf and even yoga are making sups a multi use water vehicle. EOS was one of the first shops in the Midwest to embrace sup to its fullest potential with a huge selection of boards and gear. EOS also offers lessons for every skill level by certified instructors and has an extensive rental fleet to outfit your needs.